These nets – normally around Barrow we use them during the fall time, when these catch the young seals that are coming around Point Barrow. 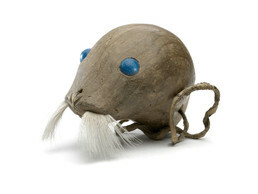 This wooden float for a seal net is in the shape of a seal’s head, with large blue beads to represent its eyes and caribou hair inserted to show the bristles on its muzzle. Nets are strung under the sea ice or in open water leads where seals are swimming. Wooden floats support the nets and also serve as hunting charms, to draw the animals near. Aron Crowell: Do you think that would be for a seal net or fish net? Jacob Ahwinona: To me it would be a fish net.